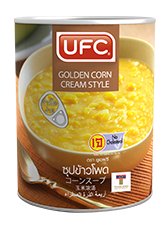 UFC Golden Corn Cream Style is produced from sweet and creamy corns. It is ideal for desert toppings (such as ice cream toppings), soup, bakery mixing and decorations. UFC Golden Corn Cream Style is packaged in a certified, clean and safe can. This product does not contain any preservatives and it is ideal for both vegetarians and vegans.